Installing bifold doors is one great way to improve your home. A house with a well-done door will certainly improve in value, but in most cases the doors are installed for personal reasons and one of them is to make the house neat and attractive. Many homeowners would want to add this improvement in their houses but unfortunately, they don’t know how to do it or where to start. That’s not a cause for alarm because the following is a guide to show you how you can add bifold doors in your house in the right manner. From the inside of your house, the beauty of the doors that you will install is the view that they will offer. A good view of your beautiful garden will be enabled by wide panes and slim frames that will give you a wide and clear view. You need to position your doors strategically so that they can offer you an excellent view as well as giving your home enough natural light. This is where you blend your home with your garden, in that they can be as a unit. It works better with garden parties where your guests will have the freedom of accessing the house and garden as they party. These doors are great options for homes that are small in size or have small rooms. When you connect the living room with your garden with these doors, you will certainly create an illusion of a big space. The good thing with these doors is that they don’t encroach the space in or outside your house. They slid to open or close, and so you can move in or out of the house freely, as if you are in the same area. Summer is a great time to spend warmer times with your family outside your house. This will be a great addition to your home, and by that give you the ability to hold dinners and other lovely moments on your backyard, without feeling detached from your main house. At times, you will not need the maximum light that bifold doors will be allowing into your house. The solution to that will be as simple as integrating blinds in the installation. They are fixed between the panes. You can hence control the light just as you want. Another good thing about that is that you can choose the type of blinds that you want, to give you a specific tone of light when you pull them down. These doors usually take most of the area of a wall where you need to install them. Because of that, you will need to get the right measurement of the same so that the doors can be fitted to perfection. The doors can be fitted with a maximum of 7 panes, meaning they can take an entire wall. Let it be modern by going for an installation with slim frames. There is the other brilliant idea of blending the outside of the house and the inside using the same floor pattern. The flooring material you have used should extend further out into your garden, where the healthy grass will start. In that way, a person who is from inside the house will not feel like he or she has exited the house even after joining the other people on the lawn. Stone flooring works best in this case. It can be used in the front area of the living room, and will also be great on the outside. Having the same pattern of the floor will also make your space feel and appear larger. These doors come in different types and material. You will also choose the colors that you want, which will blend with the face of your house too. 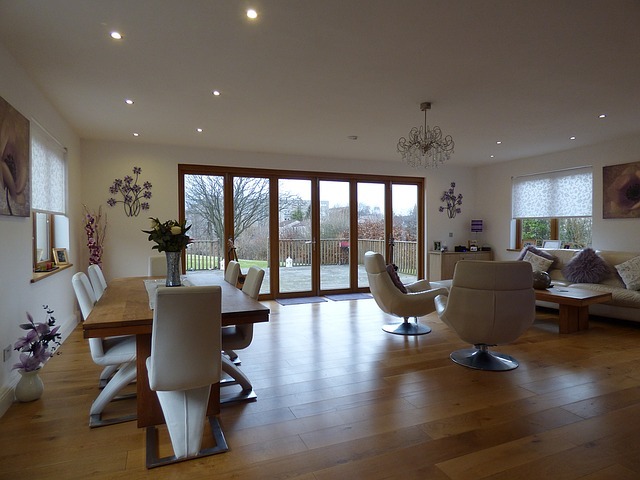 You can buy classic bifold doors, PVC or even ones made of modern aluminium. Get the right and professional installers who are able to finish the job with perfection. One area that you will need to focus on is the threshold, which ought to be low enough. It allows for easy access and you at times won’t even notice that there is a barrier between the house and the garden. A good threshold is also not a nuisance to your kids or those of the guests who will be visiting you. Last but not least, remember that as much as the doors are an improvement and adds to the beauty of the house, you need to be secure when you close them. They come with efficient locks and when you close them at night or when you are away, your home will be perfectly secure.